AMIRKHANOV, H. (ed.). Palaeolithic studies in Zaraysk 1999-2005. 466 pages, 178 colour & b&w illustrations, 4 loose maps inside back cover, 36 tables. 2009. Moscow: Paleograph; 978-5-89526-022-5 hardback (in Russian with 30 p. summaries and illustration captions in English). Archaeologists will enthusiastically welcome this major contribution to the literature on the Upper Palaeolithic of the Russian Plain. Published in Russian, this handsome book focuses on the results of recent excavations at Zaraysk (1999-2005), complete with lengthy English chapter summaries which generally do justice to the core Russian text. The figures, diagrams and truly breathtaking colour plates are also fully supported by detailed English captions, which are however hidden away at the back of the book. Working between the chapter summaries and the list of captions, non-Russian readers should easily gain access to the main results of recent field seasons. The editor's attention to detail is impressive — for example, the English captions include Cyrillic letters when needed, making it possible to see exactly how the captions relate to elements of the Russian figures. Zaraysk is an open-air Upper Palaeolithic site located on bluffs above the River Osetr, about 155km southeast of Moscow. Since its discovery in 1980 the site has been investigated under the direction of Professor Hizri Amirkhanov of the Institute of Archaeology, Russian Academy of Sciences, Moscow, and work has continued unabated to the present. Summaries of earlier field seasons have mostly been published in Russian, but a series of short reports have begun to appear in English, mainly announcing the string of remarkable figurative art finds, for which this once rather unassuming site is now becoming increasingly well known. Readers will recall the discovery in 2001 of a beautiful bison statuette (Amirkhanov & Lev 2002) and later of further female figurines (e.g. Amirkhanov & Lev 2008: fig. 4). The book consists of seven core chapters; when working through them it is worth bearing in mind that the Zaraysk 'site' covers four areas (A-D) and that the chapters focus only on area A (Zaraysk A or Zone 4 in Amirkhanov & Lev 2008: fig. 1). The excavations have revealed four distinct occupation layers, with analysis of the finds from the different levels presented in this and other publications. As a result, the focus of individual chapters in this volume tends to skip between levels, which can initially be confusing. Moreover, each chapter is written by different sets of specialist(s), and there is little attempt — beyond a short preface — to provide a fuller 'interpretation' of the site beyond rehearsing each chapter's main conclusions and the fact that Zaraysk exhibits many similarities with the Kostenki-Avdeevo culture of the Russian Plain. Chapter 1 (Amirkhanov) concentrates on describing the features of the newly-excavated Level 3 (dated roughly to 20 000 years BP). This later phase marks a major shift in settlement structure, and the numerous storage pits and pit houses that characterised Layer 2 virtually disappear, a trend also observed in the Kostenki-Avdeevo culture and possibly reflecting worsening climatic conditions. Chapters 2 (Lev) and 3 (Amirkhanov et al.) focus on the rich stone and worked bone assemblages, which interestingly appear to show general continuity in tradition despite the major changes in settlement structure noted above. English-readers will welcome the copious illustrations: Zarysk has yielded over 100 000 lithics, from finished tools to production waste. The authors demonstrate close links with the Kostenki-Avdeevo culture and the larger Eastern Gravettian entity, while intriguing patterns in the proportion of waste flakes also suggest that Zaraysk is closer to raw material sources. The rich assemblage of worked bone (generally mammoth tusk and rib, and mainly from Layer 2 at Zaraysk A) are also considered typical of Kostenki-Avdeevo habitation complexes. Chapter 4 (Amirkhanov & Lev) examines Zaraysk's mobiliary art, including the bison and female statuettes and figurative engravings. These figurines appear to have been deliberately deposited in storage pits; the female ones were placed in association with red ochre and pale sand and then covered with mammoth scapulae. In this chapter, the rather short English summary (pp. 448-51 — mostly paraphrasing the reports cited below) starts to fall out of step with the content of the Russian text, and fails to capture details of a stimulating reflection on the broader significance of these beautiful objects within the community's spirituality and ritual life. Chapter 5 (Amirkhanov et al. ), reporting on a single human deciduous tooth from a Level 2 dwelling floor, provides a further glimpse of its occupants. Chapters 6 (Burova & Mashchenko) and 7 (Mashchenko) generate some broader behavioural insights: adult mammoth bones and teeth dominate the faunal assemblage of Zaraysk A (totalling c. 63 per cent of all mammal remains from 1996-2005), but it is clear too that arctic fox, wolf and wolverine were also trapped or hunted for their furs. The wide-ranging analyses in Chapter 7 attempt to address enduring debates about the general relationship between humans and mammoths during the Upper Palaeolithic on the Russian Plain: were these communities specialised mammoth hunters who engaged in mass kills (probably not), or were they carcass scavengers, engaging in only occasional hunting of isolated mammoths (probably yes)? Some puzzling omissions in the volume must however be noted: it would be useful to have a location map that placed the site in a wider setting, perhaps including the locations of the other Kostenki-Avdeevo sites frequently mentioned in the text (see Amirkhanov & Lev 2008: fig. 1); only one radiocarbon measurement (19 100±260 (GIN-8975) on burnt bone from Hearth 3, layer 3) is listed (p. 22), leaving many chapters to resort to approximate ages; finally, given the radical changes in settlement structure due to climatic factors, it would be helpful to have a more localised sense of palaeoenvironmental changes over the time the site was occupied. Some of these gaps may relate to the fact that the book is essentially a report on recent progress. A future monograph could address some of these omissions and provide a more detailed synthetic interpretation of cultural dynamics at the site and their association with other Upper Palaeolithic sites on the Russian Plain and beyond. Looking ahead, large areas of the wider Zaraysk site remain unexcavated; without doubt, the team's work will continue to make fundamentally important contributions to our understanding of the Upper Palaeolithic communities of the Russian Plain. With the current publication the editor and individual authors have produced a lavishly illustrated and intellectually stimulating book that succeeds in reaching out to both a Russian- and English-language readership. A full monograph will be eagerly awaited and, were its full text available in both Russian and English, the international archaeological community would welcome it with open arms. AMIRKHANOV, H. & S. LEV. 2002. 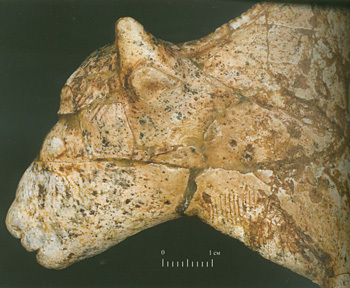 A unique Palaeolithic sculpture from the site of Zaraysk (Russia). Antiquity 76: 613-14. - 2008. New finds of art objects from the Upper Palaeolithic site of Zaraysk, Russia. Antiquity 82: 862-70.